White Like Her: My Family’s Story of Race and Racial Passing is the story of Gail Lukasik’s mother’s “passing,” Gail’s struggle with the shame of her mother’s choice, and her subsequent journey of self-discovery and redemption. 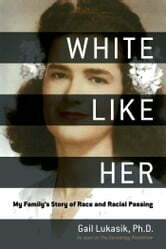 In the historical context of the Jim Crow South, Gail explores her mother’s decision to pass, how she hid her secret even from her own husband, and the price she paid for choosing whiteness. Haunted by her mother’s fear and shame, Gail embarks on a quest to uncover her mother’s racial lineage, tracing her family back to eighteenth-century colonial Louisiana. In coming to terms with her decision to publicly out her mother, Gail changed how she looks at race and heritage. With a foreword written by Kenyatta Berry, host of PBS's Genealogy Roadshow, this unique and fascinating story of coming to terms with oneself breaks down barriers.